Petroleum Conservation Research Association (PCRA), under the aegis of Ministry of Petroleum & Natural Gas, Govt. of India, is committed to make oil conservation a National Movement. As a part of its mandate, various literary and cultural events are conducted for school students. The Essay writing, Painting, and Quiz competitions aim to raise awareness among youth about practical conservation tips for the conservation of Petroleum products in industrial, transport, agriculture and domestic sector, and how to practice such tips in their daily lives. For effective communication, students may choose to present their ideas and messages for conserving petroleum products and reducing emission, in English, Hindi or Regional languages. Only those schools in India which are recognized by Central & State Boards, can participate. School is required to evaluate the entries, and upload Best two entries in each language, in which the competition has been conducted at the school, on the PCRA portal. For further details, please refer to this portal. Competition Period: 01.07.2018 to 30.09.2018. Last entry on or before 30.09.2018. The topic of the essay competition may be displayed prominently, at least a week in advance. School to advise students to prepare in advance for the scheduled competition. This shall enable the participants to obtain relevant information from various sources. This exercise is focused on increasing awareness in young minds for the National cause of Conservation of Fuel and Environment protection. 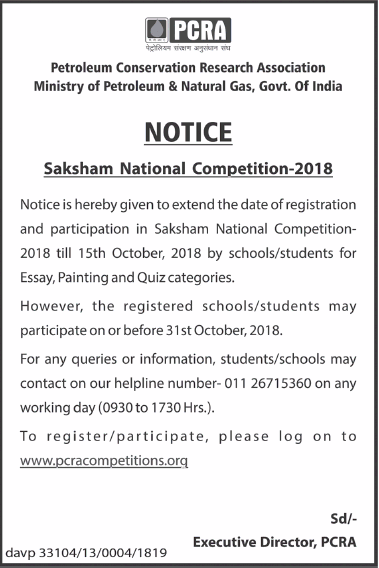 School is required to evaluate the entries for each category, and upload Best two entries in each category (Junior/Senior), in which the competition has been conducted at the school, on the PCRA portal. For more details, please refer to this portal. Competition Period: 01.07.2018 to 30.09.2018 Last entry on or before 30.09.2018. The topic of painting competition may be displayed prominently, at least a week in advance. Schools to advise students to prepare in advance for the scheduled competition. This shall enable the participants to obtain relevant information from various sources. This exercise is focused on increasing awareness in young minds for the National cause of Conservation of Fuel and Environment protection.It is advisable that the documentary on PCRA, which gives a brief on ‘Conservation of Fuel’ is shown to the children before the start of the competition. This is available on our website given here. This competition shall be conducted only online through web portal (click here) and on ground activation there after. It is mandatory for the Schools to conduct the competitions in school premises in a fair manner. It is requested that all eligible (maximum number of) students take the online quiz, as it will add to their knowledge and is in National interest. Eligibility: Students of classes 8, 9 & 10. Questions shall pertain to Fuel Conservation, Environment, General Studies etc. The schools shall register the names of all Students against the school ID on the portal (click here) . All the students can then participate as Individuals in First Round. Each student shall be given a time limit of 10 minutes to attempt the quiz of 10 questions. Software will select the two best scoring participants, who will form the School team. The School team (two best scoring participants) shall then participate in the second round or District level round, by logging in the portal, in school premises itself. This round will have 15 questions with a time limit of 10 minutes. The last date for participating at District level is 30th Sept. 2018. The Window for State level shall open on 5th Oct. 2018. The last date for participating at State level is 15th Oct. 2018. The State Level winners (school team) shall be invited to participate in offline Zonal Rounds to be held at Delhi, for deciding the Zonal Finalists. The date and venue shall be advised by Email to the schools. PCRA shall bear expenses of travel. The schools shall be informed / intimated about the winners at each level on the web portal itself as well as through emails. 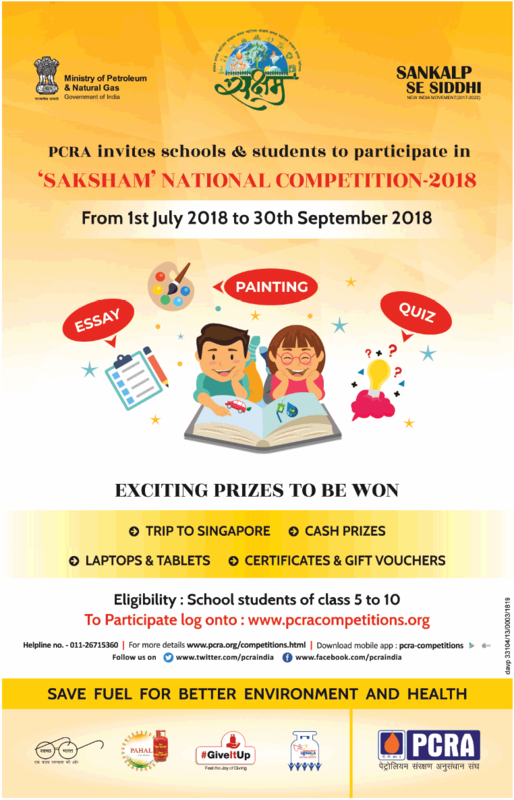 Competition Period:01.07.2018 to 30.09.18 for online Quiz competition upto District level only. Phone: 011-26715360 or email : contact@pcracompetitions.org. Please check our PCRA Competitions Portal or PCRA website for more details. The notification about extension of last date is given below.